306 beef cattle sold readily to 225 pence per kg for a 540kg Limousin heifer, prime steers to 222 pence for a 720kg Charolais. Beef cows to 188 pence for a 640kg Blonde d’Aquitaine and to £1,458 each. Friesian cows to 135 pence (760kg at £1,026). Friesian steers to 162 pence. Prime heifers: Trevor Wallace, Dromore Limousin 540kg, £1,215 (225), Charolais 590kg, £1,315 (223), D D McDowell, Newtownards Simmental 510kg, £1,122 (220), Logan Anderson, Kilwaughter Limousin 530kg, £1,139 (215), Trevor Wallace, Dromore Limousin 590kg, £1,256 (213), Limousin 630kg, £1,329 (211), Charolais 600kg, £1,260 (210), Charolais 600kg, £1,248 (208), R J Arrell, Randalstown Limousin 590kg, £1,227 (208), Trevor Wallace Charolais 610kg, £1,256 (206), Charolais 600kg, £1,212 (202), Charolais 660kg, £1,320 (200), Charolais 650kg, £1,300 (200), D Hanna, Ballymoney Charolais 640kg, £1,280 (200), T McCullough, Broughshane Limousin 510kg, £1,009 (198), D Hanna, Ballymoney Charolais 620kg, £1,215 (196), J Hamilton, Glarryford Gelbvieh 560kg, £1,086 (194), Logan Anderson, Kilwaughter Charolais 510kg, £969 (190), Charolais 530kg, £1,007 (190). Prime steers: C Reid, Aghalee Charolais 720kg, £1,598 (222), J McKinley, Bushmills Aberdeen Angus 680kg, £1,475 (217), C Reid, Limousin 610kg, £1,323 (217), J McKinley Aberdeen Angus 710kg, £1,505 (212), James McFadden, Kells Limousin 700kg, £1,456 (208), C Reid, Aghalee Limousin 660kg, £1,372 (208), Owen Park, Antrim Charolais 640kg, £1,305 (204), P Dillon, Magherafelt Limousin 600kg, £1,212 (202), C Reid, Aghalee Limousin 670kg, £1,346 (201), R Louden, Ballymoney Aberdeen Angus 670kg, £1,346 (201), L Park, Ballynure (2) Limousin 600kg, £1,200 (200), A and B Hunter, Antrim Limousin 630kg, £1,247 (198), Owen Park Limousin 600kg, £,1188 (198), L Park, Ballynure Limousin 620kg, £1,221 (197), P Graffin, Portglenone Limousin 630kg, £1,234 (196), A and B Hunter Charolais 600kg, £1,170 (195), R Boyle, Larne Charolais 590kg, £1,150 (195). Beef cows sold to: William Archbold, Newtownabbey Blonde d’Aquitaine 640kg, £1,203 (188), J P and James McKeagney, Upperlands Limousin 680kg, £1,278 (188), R Savage, Drumahoe Limousin 710kg, £1,320 (186), J W Kelso, Antrim Belgian Blue 690kg, £1,255 (182), M Diamond, Garvagh Limousin 760kg, £1,375 (181), J P and James McKeagney Limousin 810kg, £1,458 (180), J C Thompson, Randalstown Limousin 660kg, £1,174 (178), William Archbold, Newtownabbey Blonde d’Aquitaine 770kg, £1,362 (177), Robet McIlveen, Connor Limousin 710kg, £1,256 (177), Norman McBurney, Moorfields Belgian Blue 660kg, £1,168 (177), local farmer Limousin 700kg, £1,232 (176), J C Thompson, Randalstown Limousin 570kg, £980 (172), M Diamond, Coleraine Limousin 730kg, £1,241 (170), M Johnston, Toomerbridge Belgian Blue 720kg, £1,188 (165), J C Thompson, Randalstown Limousin 670kg, £1,092 (163), M Johnston, Aubrac 690kg, £1,104 (160). Friesian cows sold to: Ivan Jackson, Ballynure 760kg, £1,026 (135), 740kg, £984 (133), James Currie, Larne 750kg, £990 (132), Ivan Jackson 730kg, £919 (126), 720kg, £907 (126), R J Mawhinney, Castledawson 640kg, £800 (125), Ivan Jackson 760kg, £942 (124), B Alexander, Ahoghill 690kg, £855 (124), Stephen Stewart, Newtownabbey 660kg, £818 (124), James Currie, Larne 670kg, £830 (124), Ivan Jackson 650kg, £799 (123), Brian Lyttle, Moorfields 670kg, £824 (123), 660kg, £805 (122), B Gribben, Dunloy 720kg, £856 (119), R and C Steede, Cullybackey 680kg, £795 (117), James Wallace, Dunloy 660kg, £772 (117), R and C Steede 710kg, £823 (116), T R Lilburn, Dromore 670kg, £777 (116), R Simpson, Ballymena 580kg, £672 (116). 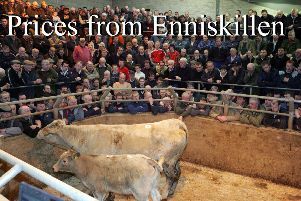 38 dairy cows and heifers met excellent demand selling to £2,120 for a choice calved heifer from J Small, Randalstown. William Alcorn, Limavady sold a batch of Holstein/Friesian mating heifers to £1,000. Ruling prices: J Small, Randalstown calved heifer £2,120, Joe Adams, Ballymena calved heifer £2,040, J Small calved heifer £1,920, W Black, Aghadowey (2) calved heifer £1,820, John Hunter, Crumlin calved heifer £1,780, G Wallace, Broughshane calved heifer £1,770, W G Johnston, Ligoniel calved heifer £1,740, Blair Jamison, Broughshane calved cow £1,700, Thomas Carlisle, Dundrod calved heifer £1,700, John Hunter, Crumlin calved heifer £1,680, L Carson, Ballymoney calved cow £1,660, T and J Mackey, Ballynure calved cow £1,460, T and J Mackey, calved heifer £1,460, G Wallace, calved heifer £1,450. 51 lots in the suckler ring sold to £1,680 for a Saler cow with heifer calf at foot. Ruling prices: R Alexander, Broughshane Saler cow and heifer calf £1,680, Saler cow and heifer calf £1,640, Saler cow and bull calf £1,620, Saler cow and heifer calf £1,510, Saler cow and heifer calf £1,480, Saler cow and heifer calf £1,460, Saler cow and heifer calf £1,450, Saler cow and heifer calf £1,440, Saler cow and bull calf £1,350, Saler cow and heifer calf £1,340, Saler cow and heifer calf £1,330, J K Davidson, Broughshane Saler cow and bull calf £1,300, R McKeen, Gleno Simmental cow and bull calf £1,210, Simmental cow and heifer calf £1,210, David Compton, Ballymena cow and bull calf £1,130, Hugo Armstrong, Coagh cow £1,120. 155 lots in the calf ring sold well to £495 for a two month old Charolais bull, younger bull calves to £485 for a month old Charolais. Young heifer calves to £370 for a four week old Belgian Blue. Bull calves sold to: David Compton, Ballymena Charolais £495, T McKillop, Glenarm Limousin £490, local farmer Charolais £485, Robin Nicholson, Monkstown Charolais £390, Ian Lamont, Cullybackey Stabiliser £380, R H and H A Shanks, Dunadry Belgian Blue £380, James Currie, Larne Limousin £370, W J McBride, Magherafelt (2) Aberdeen Angus £370, T McKillop, Glenarm Limousin £365, Irwin Gamble, Articlave Limousin £355, Anne Nicholson Limousin £350, local farmer Charolais £350. Heifer calves sold to: Ian Lamont, Cullybackey Belgian Blue £450, W J McBride, Magherafelt Aberdeen Angus £380, Gary McCammond, Larne Belgian Blue £370, D Montgomery, Glenwherry (2) Belgian Blue £360, W J McBride, Magherafelt Aberdeen Angus £350, Aberdeen Angus £340, Aberdeen Angus £330, Richard McKeown Limousin £295, Gary McCammond Belgian Blue £295, Cairnleigh Ltd, Aghalee Belgian Blue £290, W J McBride, Aberdeen Angus £290, R H and H A Shanks, Dunadry Belgian Blue £285, R J and J A Wright, Stoneyford Belgian Blue £255, J Lynn, Cullybackey Aberdeen Angus £250, James Currie, Larne (2) Limousin £250. An entry of 400 weanlings in Ballymena resulted in a steady trade. Bullocks sold to £695 over for a Charolais 500kg at £1,195 offered by J Jones, Belfast. Heifers sold to £540 over for a Charolais 490kg at £130 presented by H McMullan. S Magorrian, Downpatrick Charolais 270kg, £760 (281), J McLaughlin, Aughafatten Charolais 280kg, £780 (278), R Shaw, Rasharkin Limousin 260kg, £720 (276), Charolais 270kg, £730 (270), W Stewart, Dundrod Blonde d’Aquitaine 230kg, £600 (260), S Magorrian, Downpatrick Charolais 300kg £780 (260), A Stevenson, Armoy Charolais 300kg, £780 (260), W Stewart, Dundrod Blonde d’Aquitaine 260kg, £670 (257), R Shaw, Rasharkin Charolais 300kg, £770 (567), A Stevenson, Armoy Limousin 300kg, £760 (253), R Shaw, Rasharkin Limousin 290kg, £730 (251), W and M Orr, Ballycastle Charolais 280kg, £700 (250), J McLaughlin, Aughafatten Charolais 230kg, £570 (247), N Farquhar, Moorfields Belgian Blue 280kg, £680 (242), Belgian Blue 300kg, £720 (240), P Grant, Downpatrick Limousin 300kg, £720 (240). A McErlean, Portglenone Charolais 360kg, £1,010 (280), T McKillop, Glenarm Charolais 420kg, £1,110 (264), A Stevenson, Armoy Charolais 370kg, £965 (260), Graham Brothers, Aughafatten Charolais 380kg, £960 (252), K Brown, Upper Ballinderry Limousin 400kg, £990 (247), W and M Orr, Ballycastle Limousin 360kg, £890 (247), J McLaughlin, Aughafatten Charolais 360kg, £890 (247), J M Mullan, Knockloughrim Limousin 390kg, £960 (246), K Brown, Upper Ballinderry Limousin 410kg, £1,000 (243), W Jones, Ballyclare Limousin 410kg, £990 (241), J Jones, Belfast Charolais 500kg, £1,195 (239), J Wray, Carnlough Belgian Blue 390kg, £930 (238), P Grant, Downpatrick Limousin 400kg, £950 (237), S Magorrian, Downpatrick Charolais 370kg, £870 (235), A McErlean, Portglenone Blo 380kg, £890 (234), K Brown, Upper Ballinderry Limousin 410kg, £960 (234). W Stewart, Dundrod Blonde d’Aquitaine 170kg, £470 (276), Blonde d’Aquitaine 170kg, £430 (252), N Farquhar, Moorfields Belgian Blue 300kg, £710 (236), J McLaughlin, Aughafatten Charolais 250kg, £590 (236), Charolais 160kg, £370 (231), Charolais 220kg, £500 (227), N Farguhar, Ballymena Belgian Blue 250kg, £560 (224), W Stewart, Dundrod Blonde d’Aquitaine 250kg, £530 (212), J S Hamilton, Ballyclare Simmental 300kg, £620 (206), D Russell, Parkgate Limousin 270kg, £555 (205), E Aiken, Cloughmills (2) Charolais 220kg, £440 (200). Another full year of sheep on Monday evening resulted in a very steady trade. Breeders sold to £146, ewe lambs to £131, store lambs to £71.50. Breeders sold to: A Beattie, Dunloy 10 Texel £146, W Blackburn, Clogher 9 crossbred £142, A Beattie 10 Texel £140, Newpark farms, Dromore 8 crossbred £140, S Thompson, Glenarm 15 Cheviot £140, Seamus McNeill, Cushendun 6 Suffolk £138, local farmer 10 mule £135, J Tweed, Islandmagee 12 crossbred £135, local farmer 10 mule £132, S Thompson, Glenarm 14 Suffolk £132, J Tweed, Islandmagee 10 crossbred £132, 12 crossbred £130, local farmer 10 mule £130, A Beattie 1 Texel £128. Store lambs sold to: Ian Gibson, Broughshane 16 Texel £71.50, Walter Hoy, Templepatrick 50 Texel £71, H Magill, Aughafatten 15 Suffolk £71, R J McKay and Son, Carnlough 60 Suffolk £70, H F McKay, Carnlough 18 crossbred £70, William Hamill, Aughafatten 11 Suffolk £70, A Montgomery, Glenarm 22 Suffolk £69.50, Patrick McMullan, Carnlough 25 Dorset £69.50, R Martin, Dunloy 14 Texel £69.50, Colin McDonnell, Martinstown 32 Texel £69, Alex McCann, Glenravel 26 mule £69, J and S Bailey, Ballycastle 12 Texel £69, John O’Kane, Ballymoney 59 Suffolk £68.50, William Warwick, Moorfields 21 Texel £68.50, J Stewart, Nutts Corner 12 Texel 68, 13 Texel £68. Ewe lambs sold to: Logan Anderson, Kilwaughter 10 Suffolk £131, 10 Suffolk £122, Joel Lamont, Kells 12 Cheviot £118, Matt Gingles, Kilwaughter 8 Suffolk £112, J T Mullan, Limavady 10 Suffolk £110, 10 Suffolk £106, Roy Hunter, Broughshane 12 mule £98, local farmer 8 Suffolk £95, Roy Hunter 11 mule £95, Matt Gingles, Kilwaughter 10 Suffolk £90, R Morrow, Glenarm 2 Suffolk £89, Noel McNeill, Cushendun 13 Blackface £82, C Donnelly, Rathkenny 1 Texel £81, J P F O’Loan, Martinstown 14 Suffolk £80. An entry of 320 store cattle in Ballymena resulted in a steady trade. Bullocks sold to £765 over for a Charolais 590kg at £1,355 presented by J McMurran, Ballycarry. Heifers sold to £575 over a Charolais 530kg at £1,105 offered by Sandra Hunter, Bushmills. D Christie, Ballymoney Limousin 400kg, £930 (232), D S Porter, Crumlin Limousin 430kg, £970 (225), A and E Wylie, Martinstown Limousin 360kg, £810 (225), B McCrory, Broughshane Charolais 430kg, £960 (223), local farmer Charolais 450kg, £995 (221), J McHenry, Mosside Charolais 490kg, £1,080 (220), B McCrory Charolais 460kg, £1,010 (219), local farmer Limousin 460kg, £1,005 (218), Marion Simmons, Antrim Limousin 490kg, £1,060 (216), A and E Wylie, Martinstown Limousin 380kg, £820 (215), Limousin 350kg, £750 (214), S Patterson, Carrickfergus Limousin 500kg, £1,065 (213), J Forsythe, Islandmagee Charolais 470kg, £1,000 (212), local farmer Charolais 480kg, £1,020 (212), D S Porter, Crumlin Limousin 490kg, £1,030 (210). Carrigeen Farms, Templepatrick Charolais 530kg, £1,245 (234), Charolais 550kg, £1,280 (232), J McMurran, Ballycarry Charolais 590kg, £1,355 (229), H Crawford, Moneyrea Limousin 570kg, £1,300 (228), J McMurran, Charolais 560kg, £1,275 (227), Charolais 600kg, £1,360 (226), N and I Parker, Crumlin Charolais 600kg, £1,350 (225), Carrigeen Farms Shorthorn 550kg, £1,230 (223), S Patterson, Carrickfergus Charolais 520kg, £1,150 (221), H Crawford Limousin 600kg, £1,310 (218), J McMurran Charolais 640kg, £1,380 (215), D Christie, Ballymoney Simmental 560kg, £1,200 (214), N and I Parker, Charolais 640kg, £1,370 (214), Carrigeen Farms Charolais 540kg, £1,150 (213), S Patterson Charolais 520kg, £1,100 (211), N and I Parker Charolais 550kg, £1,160 (210). Local farmer Charolais 460kg, £1,000 (217), Charolais 490kg, £1,040 (212), Ian Graham, Ballyclare Limousin 380kg, £805 (211), local farmer (2) Charolais 450kg, £950 (211), Sandra Hunter, Bushmills Charolais 450kg, £945 (210), R P and S Robinson, Ballynure Parthenais 410kg, £860 (209), Sandra Hunter, Charolais 490kg, £1,020 (208), Charolais 490kg, £1,015 (207), local farmer Charolais 490kg, £1,015 (207), Charolais 490kg, £1,010 (206), local farmer Charolais 440kg £900 (204), Sandra Hunter Charolais 480kg, £980 (204), G and M McGuickan, Dunloy Charolais 500kg, £1,015 (203), Sandra Hunter, Bushmills Charolais 470kg, £950 (202), T Hamill, Broughshane Limousin 490kg, £990 (202). G and M Guickan, Dunloy Charolais 510kg, £1,065 (208), Sandra Hunter, Bushmills Charolais 530kg, £1,105 (208), Charolais 520kg, £1,060 (203), T Hamill, Broughshane Limousin 530kg, £1,080 (203), D Davidson, Ballymena Limousin 520kg, £1,050 (201), Sandra Hunter Charolais 530kg, £1,070 (201), G and M McGuickan, Charolais 530kg, £1,055 (199), T Hamill Limousin 550kg, £1,080 (196), R I McLaughlin, Cloughmills (2) Aberdeen Angus 520kg, £1,010 (194), C Christie, Cloughmills Simmental 590kg, £1,140 (193), Marion Simmons, Antrim Limousin 560kg, £1,080 (192), R I McLaughlin, Cloughmills Aberdeen Angus 510kg, £960 (188), Frank O’Hara, Ballymena Limousin 520kg, £975 (187), D and R Millar, Randalstown (2) Hereford 510kg, £915 (179). An entry of 2,557 sheep in Ballymena resulted in a steady trade. Fat lambs sold to 371p for a pen of 19kg at £71.50 from T Magee, Ballyclare and to a top per head of £87 for a pen of heavy lambs from Jim Sheppard, Larne. Fat ewes sold to £76. Top prices per kg: T J Magee, Ballyclare 25 Texel 19kg, £71.50 (376), N Milliken, Ballymoney 1 Dorset 19kg, £71 (373), James Magee, Kilwaughter 31 Texel 19.5kg, £71 (364), J Kane, Glenarm 13 Texel 20kg, £72.80 (364), R and M Milliken, Armoy 7 Texel 20.5kg £74 (361), W J Cubitt, Rasharkin 8 Texel 20.5kg, £73.50 (358), J McQuitty, 16 Texel 20kg, £71.50 (357), W McIlwaine, Ballyclare 4 Texel 21kg, £75 (357), Steven Ingram, Islandmagee 7 Texel 19.5kg, £69.50 (356), W J Cubitt 10 Texel 20.5kg, £72.50 (353), James Magee, Glenarm 14 Texel 20kg, £70.50 (352), John O’Brien, Ballymena 15 Charollais 21kg, £74 (352), William Davidson, Broughshane 13 Texel 21kg, £74 (352), R and M Milliken, Armoy 3 Texel 24kg, £84 (350), M Montgomery, Kells 11 Charollais 21kg, £73.50 (350), T Stewart, Cairncastle 17 Texel 22kg, £76 (345), N and J McKee, Larne 11 Suffolk 21.5kg, £74.20 (345), Ian Poole, Glenavy 13 Suffolk 20kg, £69 (345), James Rea, Glenarm 8 Suffolk 21.5kg, £74 (344), R Simpson, Broughshane 17 Texel 21.5kg, £74 (344), Lorraine Lyons 9 Texel 21.5kg, £85 (344), Crebilly farms, Ballymena 14 Rom 23kg, £78.80 (342). Top prices per head: Jim Sheppard, Raloo 6 Texel 29kg, £87, D Gaston, Carnlough 14 Texel 26kg, £85, G and M McGuickan, Dunloy 22 Texel 27kg, £85, Matt Gingles, Kilwaughter 22 Texel 27.5kg, £85, Norman McBurney, Moorfields 58 Texel 25.5kg, £84.50, Logan Anderson, Kilwaughter 15 Suffolk 27kg, £84, John McFall, Broughshane 17 Texel 27kg, £84, David McKeeman, Ballymoney 14 Suffolk 28kg, £84, R and M Milliken, Armoy 3 Texel 24kg, £84, Matt Workman, Kilwaughter 32 Suffolk 25.5kg, £83.50, R Hoy, Doagh 7 Texel 25kg, £83, Mervyn Crawford, Randalstown 9 Charolais 25.5kg, £83, C Gribben, Dunloy 63 Texel 25.5kg, £83, Sam Agnew, Ballyclare 27 Texel 26kg £83, R Wylie, Bushmills 31 Texel 24.5kg, £82, Shaws Hill farm, Kells 47 Texel 24.5kg, £82, Brian Lyttle, Moorfields 42 Texel 24.5kg, £82, J Bonnar, Broughshane 24 Texel 26kg, £82, J Campbell, Carnlough 17 Texel 24kg, £81.50, D Mills, Glenarm 31 Texel 24kg, £81, Alex Knox, Broughshane 19 Texel 24kg, £81, C McAllister, Moorfields 48 Texel 24kg, £81, M Wallace, Dunloy 15 Suffolk 25kg, £81, J Dunlop, Ballymoney 16 Suffolk 25kg, £81.